David is perfect. He may be the perfect player in every way there is. I was around Carter and Carter did a lot of the things David did, but you got the idea that Carter did those things because he wanted people to think he was a nice guy. David does it because he is a good guy. It’s astonishing. 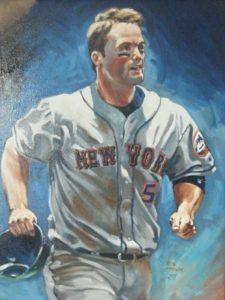 For a guy who who started and is now ending a 16-year career that has taken place completely within the MBTN Era I didn’t write a whole lot about David Wright. That’s sort of the nature of covering an aspect of the game that tracks things that change and move on: I spilled more electronic ink, proportionately anyway, on guys like Nick Evans and Bartolome Fortunato and Travis d’Arnaud, whose Met careers are a jagged line. Or on the comings and goings and stylings of Wright’s predecessor in the No. 5 jersey, Tsuyoshi Shinjo. David Wright on the other hand was such a straight line it was hard to take notice. 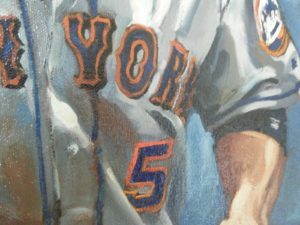 It was clear after a certain period of time he’d likely be the last of the Mets ever to wear No. 5, as deserving as any of the players to be given the “retirement” business. Looking over the archives I came across mention that Wright wore No. 72 in 2004 Spring Training while teammate Prentice Redman was issued No. 5. Charlie Samuels gave Wright No. 5 so as to align him spiritually with George Brett. But in no time he was such a steady presence I was only writing about non-David Wright things. There were plenty who wrote more. So if I didn’t say it then, let me say it now. THANKS, DAVID WRIGHT. You’re the best. My dad painted the portrait below.